Adam Gaffin at Universal Hub takes the bait, and discovers why Boston is called "the Athens of America." John Daley notes Boston has always had problems with fountains. Boston Menu Pages goes for the restaurants. I'd like to throw in the origins of the Boston baseball teams wearing red stockings. If you write a blog post about Bacon's Dictionary of Boston let me know so I can add it to the list. Bacon's Dictionary of Boston from Google Books. Written in the 1880s, this volume covers all of Boston and makes an excellent starting point for historical research on Boston. Enjoy! I've long been a fan of Moleskine notebooks, which I use in a variety of sizes for various purposes, so when I saw a display of their new City Notebooks at Brookline Booksmith, I was intrigued. I emailed Moleskine to inquire when the Boston notebook would be available and they very kindly sent me a London notebook and a Boston notebook, along with information about their new website, Moleskine City. So what is a City Notebook? The concept is that users will create their own guidebook to a city. Moleskine initially released twelve European cities, with several North American cities, including Boston, having recently become available. Far Eastern cities are due in 2008. Those familiar with Moleskine notebooks will find the usual prefatory pages for information about who to return the book to if found and the "Personal Data" section, as well pages for Measures and Conversions and International Sizes. The City Notebook maps are provided by Lonely Planet, whose London Condensed guidebook is my favorite easily portable guide to London. I would have liked to have seen slightly more extensive maps in the London and Boston books--Hampstead Heath and Canary Wharf don't make it onto the London maps, for example, but the parts of London which would be most interesting to a visitor are covered and the map scale changes for greater detail in central London although certain favorite places, like Neals Yard Dairy on Shorts Gardens won't be found because the street isn't labelled. Boston proper has good coverage, but one doesn't get Jamaica Plain or Dorchester, although Brookline Village and Harvard Square are included. Subway maps are also included for both Boston and London. Perhaps the most inspired idea in the notebook is the inclusion of reusable plastic sheets which can be layed over the maps. I'm a habitual notetaker on maps, marking off where I've been or wish to go, so the sheets help keep the maps from becoming unusable. If one uses a slightly waxy pencil, the marks one makes on the plastic sheets can be wiped off or a regular pencil with a good eraser works as well. The notebooks also have blank pages, followed by a series of tabbed sections, each with a theme, including "Food" "Drinks" "Sleep" "People" Places" "Books" and blank tabs which can be customized using the included stickers including"To Avoid" and "Musts" or you can write your own. I've started keeping information about my favorite restaurants, books about Boston I want to read, historic sites to visit, and a variety of other information in the Boston book. At the back of the notebook is an accordion pocket for storing receipts, ticket stubs, and other ephemera. The City Notebooks attempt and succeed in bringing some of the aspects of blogging and Web 2.0 into a carry along book. The DIY aspect will work well, especially for those who do a lot of initial research before embarking on a vacation. For those who live in cities which have their own notebooks, I see it as a useful tool, a vade mecum if you will. I can also see loaning a City Notebook to a friend for them to take along on a trip and having them add to it as well. One wonders if a cottage industry will develop to create content for City Notebooks. One feature I would like to see added to Moleskine City: the ability to print out blog posts and other information in a City Notebook format. For instance, if I were to create a tour of architectural sites in Boston with appropriate references to points on the City Notebook maps, it would be great to have other users be able to download and print that information in a format conducive to being stored in the City Notebook. Other have already begun to hack their notebooks, to customize them further for certain purposes. I give points to Moleskine for understanding that Moleskine users are a community and the Moleskine City promises to be a useful adjunct to the City Notebooks. If you want to know more about all things Moleskine, visit Moleskinerie a blog devoted to the cult of Moleskine. Cities available include: Boston, Paris, London, and San Francisco. Visit Boston's Victorian treasure, the Gibson House Museum. Stop by and say hello to me! Google Books is proving to be a treasure house for those looking for information about Boston's history. This will be the first post in an occasional series highlighting noteworthy books now available online. 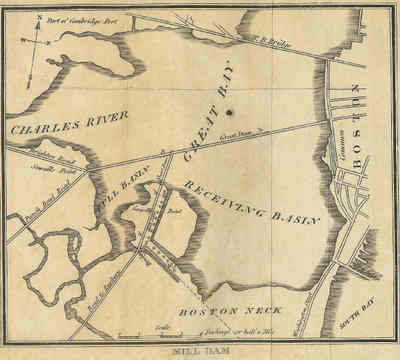 Caleb Snow's A History of Boston: The Metropolis of Massachusetts from Its Origin to the Present Period (1828) was one of the first attempts to systematically record Boston's history. It is illustrated with engravings by Abel Bowen, who was also the editor of The City Record and Boston News-Letter (version 1). King's Handbook of Boston (1881) is a well illustrated guidebook which I still use today when wandering the city. Robert Woods of the South End Settlement House produced two sociological studies of Boston neighborhoods. Americans in Process: A Settlement Study (1902) covers Boston's West End, while The City Wilderness: A Settlement Study (1898) looks at the South End of Boston. While some of Woods' assumptions about immigrants are dated, there is good information to be found about everyday in life in Boston in the 1890s. One note: I've not had any luck downloading entire books as PDF format files yet. Have others had this same issue? I don't want to be a curmudgeon, but Boston wasn't founded on 17 November 1630 as indicated by a local real estate website. While I realize that it is tempting to use free content for one's website, you often get what you pay for. To be clear: On 7 September 1630 the Court of Assistants met at John Winthrop's house and decided that "It is ordered, that the Trimountaine shalbe called Boston; Mattapan, and Dorchester; & the towne vpon Charles Ryuer, Waterton." And while 7 September might be the legal recognition of Boston's founding, Winthrop and his group had been in the Boston area since June of 1630, when they landed in Salem and made their way to Charlestown and then to present-day Boston later that summer. There are numerous other errors: John Winthrop's famous sermon on the Arbella wasn't called "A City Upon a Hill", it was titled "A Model of Christian Charity". In short, rely on that Wikipedia entry at your own peril. Still, 17 November 1630 as a founding date is closer than the author and illustrator of the book You Can't Take a Balloon Into The Museum of Fine Arts came. When you open the book you're greeted with an illustrated map of Boston bearing the claim "Boston, Massachusetts Founded 1625". 1625? That's not even close. My guess is that they used the date of the arrival of William Blaxton on the Shawmut peninsula as the founding date for Boston. Visit the Partnership of Historic Bostons for more information about the early history of Boston. Do you have a Boston history project you're working on? I'm available to consult. Email me. The City Record and Boston News-Letter is clearing out its library and has found several books which may be of interest to our readers. If you would like more information, please email me and I can tell you a little more about condition, shipping costs, etc. The first two people to order three (3) books will receive a free copy of the 1975 edition of "Victorian Boston Today: Ten Walking Tours". Most of these books are out of print, a few very scarce. I also have a number of books that I haven't put up online yet. You can browse my library and if you see something of interest, email me and I will let you know if it is for sale. The story of the failed attempt to bring I-95 through Boston. Not solely about Boston, but Chapter 6 "Boston Time" is a wonderful photo essay. Great maps, photographs, from the man who later started the Access guidebooks series. A model of graphic design in showing information about urban areas. After having read Captors and Captives, a new book about the 1704 raid on Deerfield, Massachusetts, Jay Fitzgerald at Hub Blog is looking for book recommendations about the Salem Witch Trials. Someone has already responded with Nissenbaum and Boyer's Salem Possessed, which is an excellent recommendation although I would read it in conjunction with Mary Beth Norton's In the Devil's Snare: The Salem Witchcraft Crisis of 1692. For those interested in pre-Revolution New England, I have a few other suggestions. Jill Lepore's The Name of War: King Philip's War and the Origins of American Identity examines the Algonquian Indian uprising in New England during the years 1675-76. More importantly, Lepore explores the meanings attached by both sides to the events of the war in the following decades, meanings which have reverberated to our own time. It was out of King Philip's War that the captivity narrative appears, a soon to be standard colonial literary genre in which an settler woman is kidnapped and lives amongst her captors, returning later to "civilization". The captivity narrative would be stood on its head by the experience of Eunice Williams, the daughter of John Williams, a minister killed in the Deerfield Indian attack of 1704. Eunice Williams chose to remain with her captors, to the dismay of New Englanders. Her experiences can be found in John Demos' The Unredeemed Captive: A Family Story from Early America. Another book (a set of three books, actually) which should be looked at is New England Begins: The Seventeenth Century. This is the catalog of a 1982 Museum of Fine Arts exhibition with hundreds of illustrations of the material culture--maps, furniture, clothing, silver, tools, etc.--of early New England along with essays on a variety of subjects and detailed descriptions of the objects pictured. It is unfortunately out of print, very rare, and very expensive. I've only seen the set in a used bookstore once, the Bryn Mawr Bookshop in Cambridge where it was inexplicably priced at $9. You won't find a better introduction to colonial new England. 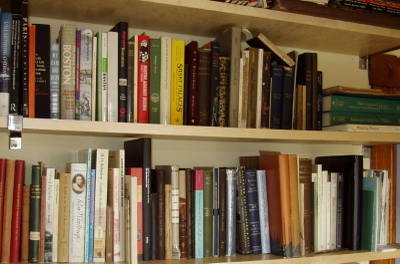 Some of the Editor's books. Summer means reading and the City Record and Boston News-Letter has some suggestions that you city lovers might find enjoyable. Actually, Fall, Winter, and Spring mean reading too, but since every other publication in the world publishes a summer reading list--why shouldn't I? Note to Southern Hemisphere readers: this is a winter reading list for you. Up in the Old Hotel might be the best 20th century reportage about any city (in the English language at least). In these essays, originally written for the New Yorker, Mitchell explores mid-century New York City with an eye for the unusual, the underappreciated, and the unknown. His love for New York City's eccentrics is obvious and his ear for conversation will astound you. Before Mitchell became a staff writer for the New Yorker, he spent several years as New York City newspaper reporter. Most of these pieces are newspaper stories: late night patrols with New York City police officers, his coverage of the Lindbergh kidnapping trial, and interviews with all kinds of people, including Gene Krupa and George Bernard Shaw. My favorites are the burlesque dancers in the chapter titled "Cheese-Cake". His interview with Florence Cubitt, one of many dancers who hoped to become the Sally Rand of the 1939 New York World's Fair, is a masterpiece. As Mitchell notes, "It was the first time a woman I had been sent to interview ever came into the room naked. I say she was naked. Actually she had a blue G-string on, but I have never seen anything look so naked in my life as she did when she walked into that room." And Brian McGrory complains about the weather causing women to swathe themselves in Gore-Tex! I've written about this book previously and the themes suggested in it are worth considering as Boston enters the 21st century. The music of my youth, with a brief (very brief!) account of Boston's own Mission of Burma, but much more about British music in the wake of the punk explosion. While the book is about music, Reynolds also examines the environments which spawned bands like the Mekons (Leeds) Orange Juice (Glasgow), the Specials (Coventry), and Joy Division (Manchester), among many others--the post-industrial decay in the English hinterlands helped thriving music scenes develop all over the country. A collection of essays looking at the problems and possibilities that await Boston, including essays by Robert Campbell and Jane Holtz Kay, Howard Bryant, Jack Beatty, and Susan Orlean. Read any good books about cities lately? What will you be reading this summer? Leave a comment! I would like to thank my readers who have bought books from Amazon via my website. Did you know that anything you buy from Amazon gives me a small commission if you go to Amazon from the City Record and Boston News-Letter? That's right--books, music, blenders, a tub of 9000 ladybugs (don't believe me? click the link), and special thanks to the person who bought the X-Box. Now if I can just get 100 people to buy this $225,000 watch, I'll be all set. So if you're going to buy from Amazon, why not start by going through my site to get there? It is easy and painless! Another installment of "All the Streets in Boston"--at least those listed in the 1910 edition of A Record of the Streets, Alleys, Places, Etc. in the City of Boston. Highlights include the history of Beacon Street, the Barricado, Bedford Street, and several of Boston's earliest streets. Have fun!